In the Spring Semester, the study trip allows students to experience the practical side of international humanitarian law (IHL), international human rights law (IHRL) and international criminal law (ICL). This trip is a marvellous opportunity to understand the work of international organizations and NGOs, meet staff and experts and discuss IHL, IHRL and ICL issues. The Geneva Academy Student Association is responsible for organizing the LLM study trip, which is partially financed by the Geneva Academy. Students travelled to Belgrade where they met experts and institutions who work in the fields of international humanitarian law, international human rights law, and international criminal law. Students travelled to Belgrade and Pristina where they met a wide range of experts and institutions who work in the fields of IHL, IHRL, ICL, transitional justice and migration. Alongside, they also had the opportunity to discover a new region and culture! Students went on a nine-day study trip to Belgrade and Kosovo where they met with a wide range of leading actors in the region including the International Committee of the Red Cross (ICRC), the Humanitarian Law Center (HLC), the United Nations Mission in Kosovo (UNMIK), the Office of the United Nations High Commissioner for Human Rights (OHCHR), the United Nations Development Programme (UNDP), and the Human Rights Review Panel of the European Union Rule of Law Mission in Kosovo (EULEX). Students travelled to Bosnia-Herzegovina and Serbia, where they learned more about work and challenges in a post-conflict zone and the ways in which different organizations – the Organization for Security and Co-operation in Europe (OSCE), United Nations High Commissioner for Refugees (UNHCR) and NGOs – operate in the field. 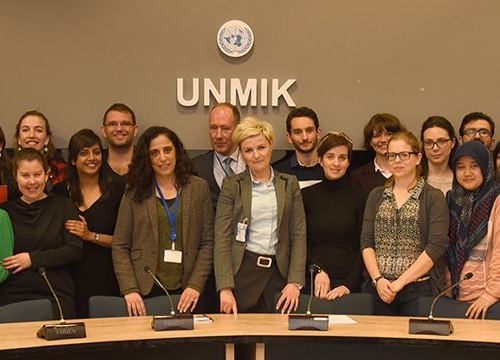 Students went to The Hague and Amsterdam, where they met judges, prosecutors, defence counsel and other staff from the Special Tribunal for Lebanon, the International Criminal Tribunal for the former Yugoslavia and the International Criminal Court.  The Geneva Academy provided me with the chance to get in touch with very distinguished international law practitioners and academics. It was a unique opportunity to meet the people behind the books I used to study and have discussions with them on a daily basis.